Action 1: Clears Heat and Relieves Toxicity. Action 2: Cools the Blood and Disperses Swellings. Use 1-3 grams per day topically. We suggest mixing 1-3 grams in a non-irritating lotion and apply topically or as recommended by your physician. Discontinue if any skin irritation results. 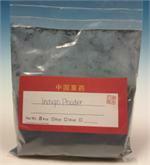 "Indigo naturalis is a traditional Chinese medicine derived from the plant Strobilanthes formosanus Moore. ...Lin's team mixed the indigo powder with a base made of petroleum jelly, yellow wax, and olive oil." The original published article concluded that: "Topical indigo naturalis ointment was a novel, safe, and effective therapy for plaque-type psoriasis." For more information on the recent news article on Indigo and psoriasis please click the link below. Using Indigo Naturalis for psoriasis of the scalp. Recently a customer called to reorder Indigo and stated that it helped control his psoriasis of the scalp. We asked how he used it and he stated that he took one Sanjiu packet of Indigo* and ground the powder even finer, then mixed the powder into one tablespoon of a natural brand of shampoo. Then he used it to shampoo his scalp. He did this daily and was very happy with the results. Note: The color of this product is a dark blue. Product photograph's may not capture the most accurate color. *The Sanjiu extract packet contains the equivalent of 1 grams. Please consult Chinese Herbal Medicine: Materia Medica for more information on the uses of individual herbs. We have many other books that give recipes for formulas that you can make with the Sanjiu herbs.